She sits on the bus stop, with nowhere to go. She lives on the road, dust being her only companion. Ask her if she has anyone in the world, her eyes get moist. Muted, she tells she has a daughter and a son. She has been dumped by her own children. But she still waits for them. She cannot walk, can hardly see. She has no one to talk to her, no one to share her pain. Other beggars throw stones at her. They threaten; abuse her; her money they steal. They do not see her pain. They too have a stomach to feed. I ask her if she is willing to go to an old age home. She has spent years now in solitude. 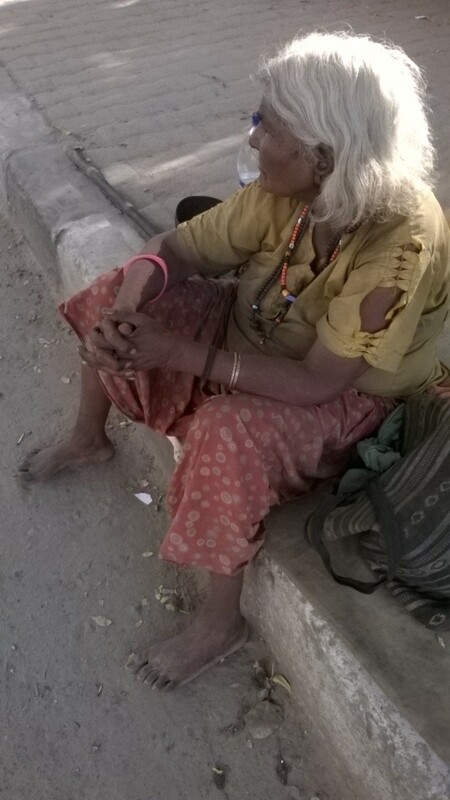 With loneliness, poverty and old age, she has ‘adjusted’. She is bare foot I realize. I get her a pair of shoes. Excited like a child, she screams in joy. In her eyes, I see a warmth and gratitude. When the shoes don’t fit her, she is scared. If she parts with these, will I get her another pair? She folds her hands, and asks me if I will get her a different one. I assure her I will not leave her feet bare. When someone gives her something to eat; she feels God’s presence in that helping soul. Her words are full of blessings. She has suffered so much, she fears her future. But she bears the heat, rains and winters as she sits there smiling. In her eyes, I see questions. On her lips, I see a prayer. In her heart, still there is hope. Someday her children would come to see her. Someday she too would go back home. She wants to die in her children’s arms. She still is a mother at heart. Her heart beats for them, her eyes yearn. I wish I could make her world beautiful. Sitting in the same place, she waits for me every day. I feel a joy in giving her, I also feel helpless. I also ask God why he has created the world this way. Why so much inequality, why so much misery? Why do people sleep empty stomach and sleep on the street? Aren’t they his own children, aren’t they too his creations? Doesn’t he feel his own failure in their dejections and defeat?